Why put your needs aside for the sake of total strangers? How much money, time and effort does it take to make an impact? How does this experience change you? 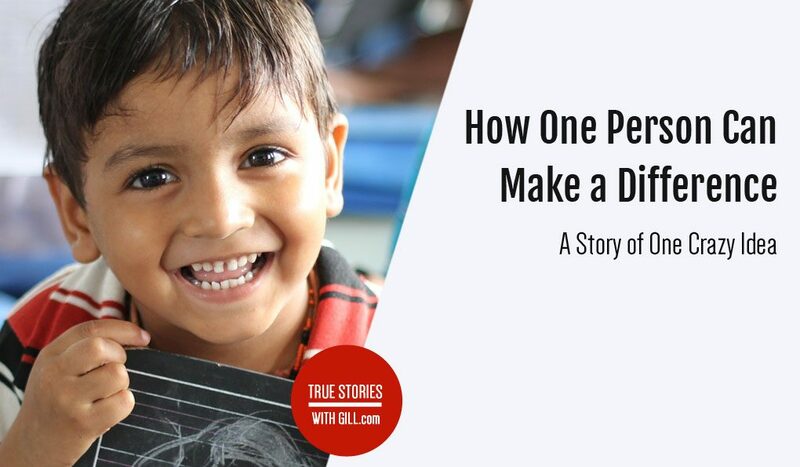 An inspirational story about how one person can make a difference. Son watching his father working on a machine noticed something written on it. Son: Because it has “danger” written on it. It means not safe. Son: I learnt it in my school. Overwhelmed with pride, father hugs his son. This story would be nothing special if this boy lived in the USA or Europe. But 12-year-old Sohail lives in Pakistan, and instead of going to school he goes to work. 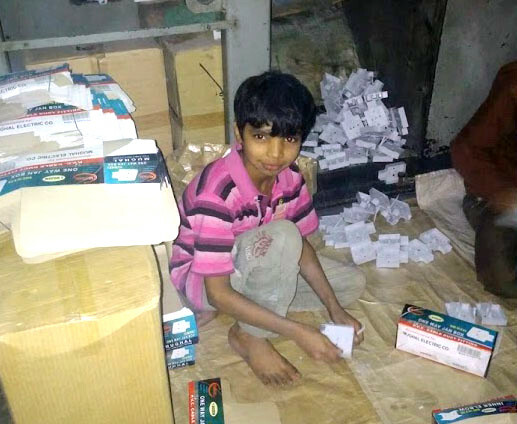 Sohail works in the packing and filling workshop. He is a child laborer – one of the 2.5 million kids in Pakistan working for less than $1 a day. His family can’t afford his education and is relying on the salary of this 12-year-old boy to make the ends meet. For children like Sohail, school – as well as “normal” childhood – is not an option. In Pakistan, 22 million children are out of school. Among them: 2.5 million of child laborers, 13% of all children between 10 and 14 years. This world is not a fun place to live in. War, poverty, crime, accidents, disease outbreaks. Even if you don’t own a TV, your favorite social network will gladly inform you about all the juicy details on the latest disaster. You don’t have any other choice but to become immune to this. Because your family needs you sane and functioning. Because you have your own, very real problems to deal with. So whatever free time you have, you spend it doing something that helps you relieve the perpetual stress. And listening to a life story of a homeless person or looking in the eyes of an orphan does not fall into this category. Changing the world? Most of us are too busy and too tired for anything more than a donation. 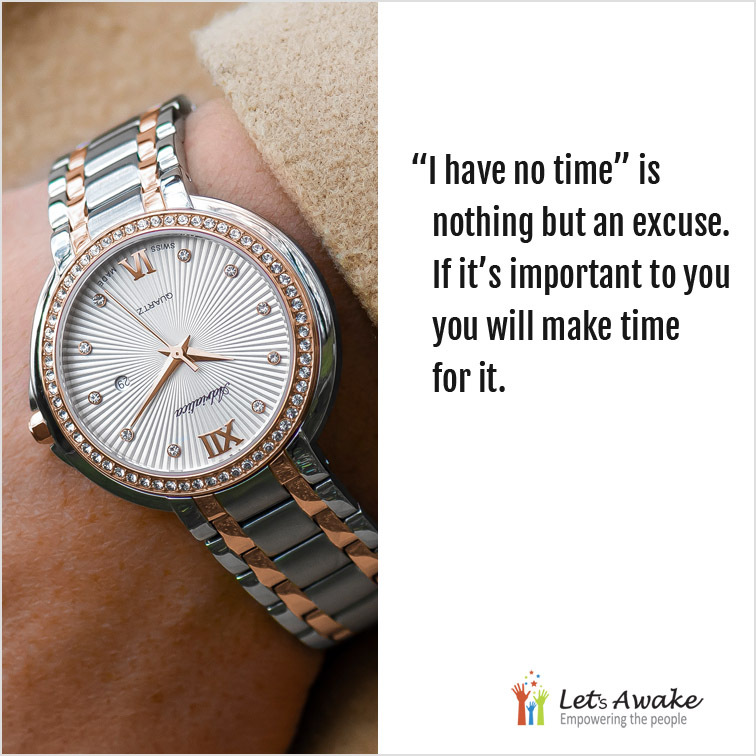 Most of us, because there are few others who decide to spend whatever free time and energy they have to actively and consciously make a difference. I used to think these people had too much free time, energy and funds (and no problems of their own). How can a regular person with kids, a full-time job and a mortgage change anything on a larger scale? Impossible, so I thought. Until I saw it happening. 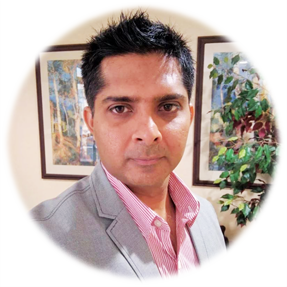 Meet Kashif Riaz Zahid, a co-founder of Let’s Awake, a non-profit organization that provides free education to child laborers in Pakistan. Kashif was born and raised in Lahore, Pakistan. To advance his career, he moved to Canada 8 years ago, but as he puts it himself Pakistan will forever have his heart. During the day, he works as an IT engineer. In the evening, from the moment he enters his house, he is with his 3 children to teach and play. Just a year ago, he would watch TV or surf the web after the kids would go to bed. But there is no time for it now, after he started his MBA early 2015. Shortly after that, in February 2015, together with his two friends, he created an NPO to provide free education to child laborers in Pakistan. He called it “Let’s Awake” to pinpoint what he thought the “sleeping” society oblivious to the problems of others had to do: Wake up. Since the start of the project, Let’s Awake opened 3 classes and delivered 420 lectures to overall 45 child laborers (among them, 15 girls). Sohail, the boy who was able to read the English word “danger” to warn his father, was one of these children. Despite being such a young organization, Let’s Awake has already gained a lot of support. How can someone with such a busy life and no previous experience in this regard create an organization like that? Why wasn’t it enough for this person to simply set up a monthly donation and go on with his life with a clear consciousness? What made an idea in a notebook become a reality? How much money, time and effort did he have to invest? 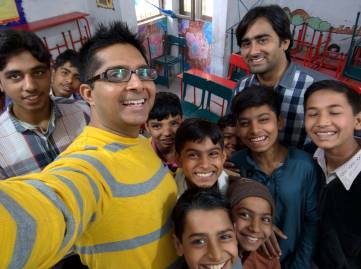 What did Kashif and his friends feel when they met their first students? How did this project change the life of the children and his own life? This (and more) is what Kashif and I talked about. What we often see as an action is a result of a seed that have been planted long before we decided to do something. Gill: My main question – the question that made me reach out to you – is: Why wasn’t it enough for you to just donate? Kashif: That’s a difficult question. To be honest, I don’t have a straight answer. There are many factors that came together. I think, what we often see as an action is a result of a seed that must have been planted long before we decided to do something. For once, I was always bothered by the way how our life revolves around the “I”: “My” looks, “my” grades, “my” job, “my” status, “my” family. I felt that we can’t be that selfish to live our entire life just for ourselves. I thought there must be a place for others who are not related to us in our lives as well. Gill: I can imagine many people feel like this. Yet, not everyone acts on it. Kashif: You are right, these two things on their own might not be enough. 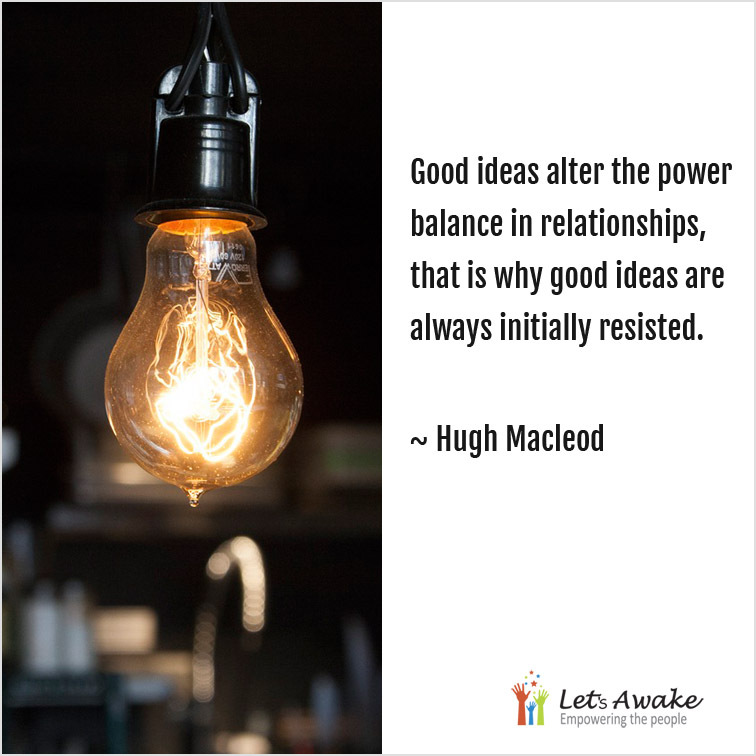 But they make you restless, they occupy your mind so that you are always – consciously and unconsciously – looking for ways to do something about it. Until one day you see or read something, and it’s your light bulb moment. But of course, from this moment till you see your idea in action there are many other things that need to come in place. For example, you need a concrete idea that you believe in 100%. You need at least 2-3 people you can openly discuss this idea with. You also have to be open to leaving your comfort zone, because as you go forward you will be doing things you’ve never done before. And most importantly, you need a partner who is ready to take this plunge with you. Because even if you’ve done your homework, you still have doubts. Will my idea work? Will I be able to execute it? When you have someone else who is ready to do it with you, it reduces the pressure and your fear of being wrong. In my case, all these circumstances luckily came together. Gill: You have 3 kids and a full-time job. How do you find the time and energy for Let’s Awake? Kashif: For many years, I used to complain that I don’t have enough time to do something extra – get an MBA, learn a new skill, or go to gym. At the same time, I was always amazed by successful people in the world who manage to do so many things in those same 24 hours. I realized that “I have no time” is nothing but an excuse. If it’s important enough for you, you’ll make time for it. “I have no time” is nothing but an excuse. If it’s important to you, you’ll make time for it. I started reading about the time management skills taking advice of successful entrepreneurs. Now I still have the same amount of time as before, but I learned to manage it better. Gill: How did you get the idea for Let’s Awake? Kashif: You feel more for your homeland and the people there when you live abroad. Whenever we and our friends and families living overseas come together, we discuss all the problems back home and how our government is failing to fix them. We share our opinions, and of course everybody is an “expert” who knows exactly how to solve these problems. But as soon as the dinner is over, we go home and get busy with our lives. It’s not that we don’t want to help. Almost everyone I know donates on regular basis. It seems like the best possible option when you are far away. You can’t eliminate world hunger, but you can feed one hungry person. I’ve been doing it myself for many years, till I became uncomfortable with this entire cycle. There have been many times when I thought of doing something more than making a bank transfer. But every time after I slept on it, it didn’t seem that important next day. I thought I didn’t have the time. Besides, one person can’t solve world problems anyways. Until one day when I’ve realized that there won’t be ever the right time or enough time to do it. I have to make time for it. And although I can’t eliminate world hunger, I can feed one hungry person. I wanted to make a difference, and so I started thinking about ways to do it. When I was growing up, education was always given the highest priority in our home. My parents made a lot of compromises to be able to give us quality education. The birth of my first daughter opened a totally new world for me – a world of a child. I started spending more time around children, noticing how quickly they learn and realizing that it is very important to give them right information from the start. Every time when we would go to Pakistan, I felt disgusted by the information fed to the children through media, especially TV. I used to tell my wife that if I had special powers I would wipe off the current media feed for children in Pakistan and replace it with something that is entertaining and useful at the same time. That’s why I decided to do something related to children and their education. I sketched the initial idea of Let’s Awake, but for several months it was just an idea in my notebook. Gill: What gave you the final push? Kashif: One day, in winter of 2014, I saw a post on Facebook of my friend Rezwan Iqbal about an idea how to feed the poor people in Karachi, Pakistan. This was my light bulb moment. I reached out to him, and after an hour and half on the phone, we decided to work together. There is only one way to improve the condition of our society: Educate more people. Over the next 3 months, we looked at all the problems in Pakistan – poverty, unemployment, intolerance, electricity shortfall, etc. – and concluded that lack of education is the root cause of most of them. That’s when I shared the idea of teaching children online. Rezwan suggested to focus on the child laborers who are eager to learn but have to financially support their families instead. Gill: How did others respond to your idea? Kashif: My wife was very supportive, and most of my close friends and family members responded positively. Further down the road though, we experienced a fair share of negativity and question marked faces. Some thought the idea of teaching children online being that far from them was absurd. There were also few who weren’t opposed to the idea itself, but were convinced that IT infrastructure in Pakistan wouldn’t allow our plan to succeed. When you feel like giving up, remember the reason why you started. You will realize that you can’t give up before you’ve done everything you could. Gill: You had no prior experience of setting up a business, let alone a non-profit organization. Which difficulties have you encountered in this regard? Kashif: We had no prior experience of setting up a business, let aside a non-profit organization. It was one thing after another that we didn’t know. We had to search, read up, and reach out to experienced people, always questioning whether we are doing it right. The legal aspect was the most complicated for us being engineers. It was also difficult to find a partner in Pakistan that buys into our idea. We felt lack of commitment, timely response, and understanding of how technology can contribute to the education process. There were many occasions when we felt like giving up. What kept us going was reminding ourselves of the reason why we started this and the realization that we can’t give up before we’ve tried everything we possibly could. Gill: Let’s Awake works with child laborers who go to work instead of school. How did you find your first students? Kashif: For the first batch of students, our local partner, Ghani Welfare Foundation went to workshops and factories where these children work. They talked to several children to find out why they couldn’t go to school and whether they had interest in getting education. After that we approached their parents and supervisors. We told them about our program seeking their permission for these children to enroll in our program. Gill: I can imagine that the families of the children and their supervisors were skeptical of your unorthodox idea as well. They relied on those child laborers working, and you wanted to send them to school. Was it easy to convince them to let the children take part in your program? Kashif: It was extremely difficult to convince their families and supervisors at work. The families of the children had difficulty understanding the model. They assumed if their children will go to school they will have to quit work, which would mean financial setback. However, our local partner Ghani Welfare Foundation did a great job explaining that we only need two hours of the children’s time, and we will even provide free breakfast. As for the supervisors, we had to explain to them that the work of the children won’t be affected. Instead, they will learn something meaningful that might in turn increase their productivity. Gill: You are in Canada, but you need things to happen in Pakistan. How do you manage for the equipment to be installed, for people to show up, etc.? Kashif: For the tasks outside the classrooms, we made use of the contacts we had in Pakistan. For example, my brother was the one who purchased the equipment and handed it over to the local partner for installation. We also partnered with local non-profit organizations that are now helping us with logistics and bring children to the classrooms. As all the lectures are delivered via Skype, we don’t have teachers physically present in the classrooms. We just need one person present in the classroom to start and monitor online sessions, maintain discipline, and report feedback – be it in the form of conducting tests, keeping a track of students’ attendance, or meeting their parents. Gill: This is such a unique idea. How could you be sure it will work out the way you intended? Kashif: Of course we had to test our idea first. In particular, we had to be sure of the quality of audio/video, our methodology, and reaction of the children. So we asked Ghani Welfare Foundation to let us teach Science to their Grade 4 students – a class of around 20 children – for one month using our method. These students showed improvement in their attention and comprehension. Also, their interest in Science increased due to the interactive material we used and the way we delivered the lectures. That gave us the confidence to kick off our project. At that point, only a handful of people knew about it and we hadn’t received any donations yet. Seeing the children make progress is what makes it all worth it. Gill: You and your friends had been working very hard on this for 16 months. It started with an idea in your notebook, and now you were witnessing it becoming reality. Do you remember how you felt before the very first lecture? Kashif: It was a mixture of emotions. A few days before our very first teaching session, we held a video conference call with the parents of the children from our first batch. There were around 40 parents looking at us from the other side of the computer screen. We had an excellent 2-hour session and received a lot of questions as well as praise for offering their children a chance to study. But towards the end of this call, my partner and I were shaking from the amount of responsibility we felt towards these children and their parents. We prayed to God to give us strength not to disappoint them. Seeing a room filled with 15 children on the first day felt like a tremendous achievement for us. It also gave us confidence to move forward. But most of all, we feel over the moon whenever we see our children making progress. Gill: How do kids themselves respond to your efforts? Kashif: The response from the children has been very positive. We have a retention rate of more than 80%. Most of the kids in our program have shown great progress. They understand and acknowledge our efforts to help them get education. Seeing these children make progress is what makes it all worth it. Educational expenses for one child are $15 CAD (~$11 USD) per month. Gill: How long does your program last? Kashif: Initially, we planned the program to last 6 months. However, now we will extend it up to 12 months. Gill: And what happens when the program is over? If a child performed well and is willing to go to school full time, we will try to convince their parents to let them go to school while we pay for it. If a child didn’t perform well enough, we will sponsor their vocational training to increase their employability. As for the children who performed well but can’t go to school full time, we would like to take these children away from their hard jobs. Using the same 2 hours we would teach them a secondary skill like programming, web development, graphic designing etc. This will open a new world of possibilities for them. How much money does it take to make a difference? Way less than you think. Gill: How much did it cost to kick off this project and where did this money come from? This money came out of our own pockets – mine and of my two friends who have been there from the start: Rezwan and Awais. We started receiving donations only after our supporters saw a functional classroom ready for the students. Gill: How much does it cost a month to keep the project running? Gill: At some point, you couldn’t carry the expenses yourself and had to raise funds, which was another difficult task. How did it go? I had been a shy person when it comes to asking for help or something that doesn’t belong to me since my childhood. So when the time came to raise funds to take this program public, this became my personal nightmare. My partners and I were very nervous about asking for money. At that time, we had nothing but a good intention, proof of concept, and personal credibility to offer. However, when we shared our program with the general public, we were overwhelmed with the positive response. Other people started entrusting us with their hard-earned money. Initially, most of the people who joined us belonged to our work circle: Friends and colleagues who themselves have immigrated from Pakistan. Later, people from extended circles and complete strangers with all possible backgrounds and skills started offering their help. Since then we feel a dual responsibility on ourselves: Not only to keep our promise to the children and their parents but also to use the money our supporters have entrusted us with in the best possible way and with extreme care and transparency. Gill: How did your life change after Let’s Awake, apart from the fact that now you have even less free time? Do you feel different about certain things or yourself? Kashif: The entire experience so far has helped me develop more empathy. I try to look deeper into things instead of taking them at the face value. Most of the times, there is a second – or sometimes third – reason for one’s behavior. I also feel more empowered as I see our idea turning into reality and something other people can relate to as well. Most importantly, this experience has helped me gain confidence to reach out to others – sometimes complete strangers – to ask for their support for our cause. This has been the biggest take away in my personal life. And of course, I can’t but feel more grateful for what I have in my life. Gill: What are your future plans for Let’s Awake? Kashif: We want to launch our program in other cities in Pakistan (Karachi and Islamabad) as well as open more classrooms in Lahore. We are also looking to collaborate with other initiatives such as Reading Room Project, 50 Kids, Ravvish, Rabtt, and Rizq so we can amplify each other’s impact. In the future, we are planning to extend our model to mentor college and university students. Our plan is to work with successful professionals overseas who will deliver webinars to help students prepare themselves for the future. We all have limited time at our hands. You want to live it the most? Help others. Gill: If someone wants to help your cause, how can they do it? Kashif: There are many ways you can contribute, ranging from a small donation to sharing your time and skills with us. The easiest way to contribute is to make a donation or sponsor a child. If you’d like to contribute on a more personal level, we are always looking for volunteers who can share their skills with us. For example, if you speak Urdu you could become one of our instructors to teach the children directly. This would take only 2 hours of your time a week and doesn’t require you to have previous teaching experience. …and spreading the message, especially within overseas Pakistani community. Apart from that, we seek support from educationists and psychologist specialized in dealing with child laborers and out of school children or teenagers. You can fill out this short form or drop us a message at info@letsawake.org. Gill: Thank you so much, Kashif, for what you are doing, and for finding the time to share your story! I’m sure there are many people out there who want to do more, who also have ideas in their notebooks, but who are still hesitating not sure where to start or whether it is even worth trying, whether one person can make a difference. Kashif: I would like to tell them this: Look around you. Do you see something that you don’t like? Do you see someone in need? Take the first step and offer a helping hand. Don’t worry about the results or not having enough experience. Just listen to your heart and do it. That one smile, the feeling of relief from doing the right thing, or a “thank you” from the other person will turn your life around. It all starts with the first step. You will be surprised by the power you have to make a difference in this world. Previous post Great Job That Comes at a Cost. A Story of One Intelligence Consultant. Would you sacrifice a part of your own needs and the needs of your family, maybe even take a financial risk for the sake of making a difference in the life of complete strangers? I think this is an interesting question. Because I think generally speaking, almost everyone thinks it’s important to make a difference with their life. But as soon as it comes to actually doing something, we realize that it will require some sacrifices that we are often not willing to make. So I’d love to hear your opinion about it. As to my personal opinion on this: I thought hard about it, and I must honestly admit I won’t be able to do it. What a wonderful read! Kashif’s efforts are definitely unique in Pakistan. Many charities work towards ridding poverty, child labour and basic healthcare but not many make direct education a focus. I will definitely donate and hope that they are able to scale these efforts further. Thanks a lot Ammar for the encouraging words and your support. It is true that the focus on education has been an issue. That’s why we took it up ourselves. Please reach out to me if you would like to learn more, have any questions, or suggestions to expand/improve. Needless to say, please share this effort with more fellow Pakistanis who are willing to give these children a chance to improve their lives.